Valentine’s Day is just around the corner, so I thought I’d create some Sweet Valentine inspiration for you. 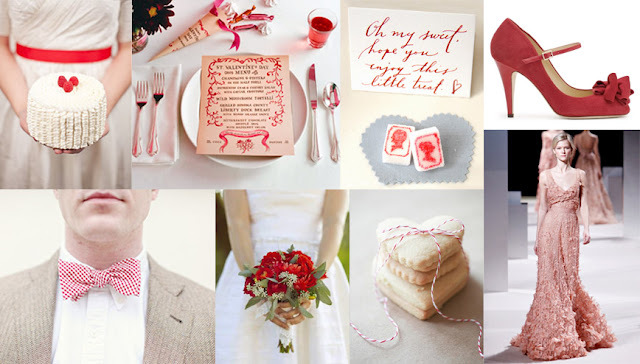 You can do a Valentine’s wedding, without it being overly Valentine-ish. I love this more subtle and charming take on the day of love. Some simple red flowers and delicious treats will do the trick. I am in love with this darling ruffle cake! Add in these heart shaped cookies and silhouette sugar cubes, and everyone is in for a sweet treat. This polka dot bow tie is a must for any Valentine’s groom. For the gown, abandon the wedding dress white for this blush tone stunner. This beauty is so fabulous, I don’t think anyone would blame you! this is just so pretty - loving the place setting and cookies tied together. i love this Megan!! that ruffle cake is so cute! seeing this makes me love Valentine's Day. Thank you for making love day so pretty! This inspiration board is so awesome! That blush dress is so beautiful! ooh! i love that red and white bow tie! too cute! So pretty, love the bow tie and the twine!! :) How stunning is the pink gown and red heels! This is beautiful! Really love this palette! Oh Megan this is just gorgeous!!!! Pink and red are so pretty together. And I am loving the ruffle cake and the bow tie!!!! Love the whimsy of this... it all goes so perfectly well together!